May 21, 2016 – NASA and the Italian Space Agency (Agenzia Spaziale Italiana, or ASI) have agreed to conduct a joint feasibility study on potential cooperation opportunities during the robotic segment of NASA’s Asteroid Redirect Mission (ARM). Since the announcement of NASA’s ARM in 2013, NASA has sought ideas from external communities to identify innovative concepts while the mission is still in early formulation. The study with ASI provides an opportunity for the two space agencies to have a focused dialogue about potential collaboration. The first segment of NASA’s two-part ARM includes a solar electric propulsion powered robotic flight to a near-Earth asteroid in the early 2020s to capture a large boulder from its surface, and then deliver the mass to an orbit around the moon. The second segment is a crew mission in the mid 2020s to investigate the asteroidal mass near the moon and return samples to Earth. ARM will demonstrate a number of capabilities needed for NASA’s Journey to Mars including high power solar electric propulsion and astronaut interaction with a natural object in deep space, and may provide the opportunity for exploring use of asteroidal resources. 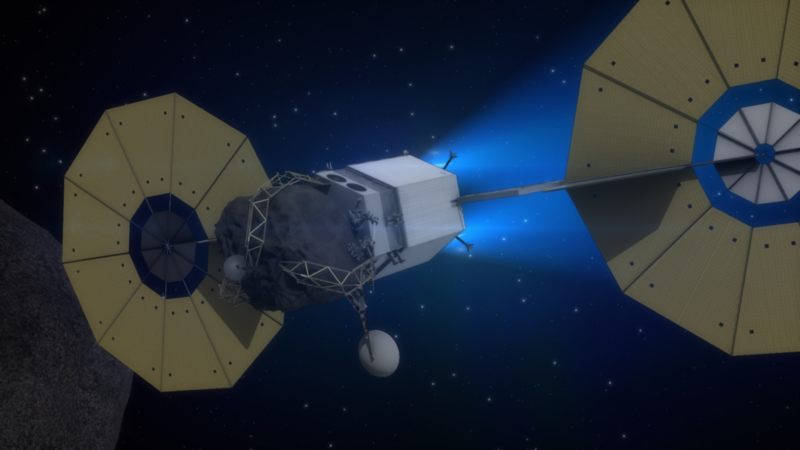 NASA and ASI have agreed to study several areas of potential cooperation on the robotic segment of ARM, including means to characterize the asteroid, which will help in selection and acquisition of the asteroid boulder, as well as other ways to leverage ASI capability and our mutual interests. ASI President Roberto Battiston values the target identification work that NASA has conducted in support of ARM, and sees promise for commercial ventures. The ARM robotic mission concept is maturing toward NASA’s Key Decision Point-B, or KDP-B, scheduled for this summer. During KDP-B, NASA will decide on preliminary system-level requirements and operational concepts, as well as baseline the project requirements and work agreements across the NASA centers for the next phase of development for the mission. Launch of the ARM robotic mission is targeted for late 2021.